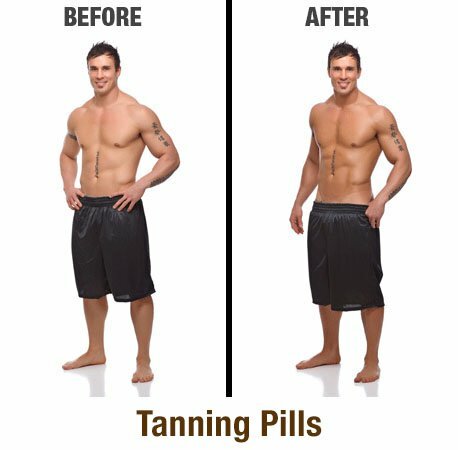 Tanning tablets are the future and have many benefits over more traditional tanning methods. Read on and find out how these magic pills can make your life much easier. The dangers of sunbathing and using sunbeds are apparent, everywhere you look nowadays there are warnings regarding the risk of being exposed to UV rays. However, we all still prefer to have that golden brown and sun-kissed look, as opposed to being pasty and white! With tanned and golden skin you look so much better and it really does help to increase your self-confidence. The dangers from UV rays from the sun are widely broadcast. Skin cancer is one of the most common cancers in the UK, with malignant melanoma being the most serious type. The ultraviolet rays in the sun are what cause the damage to your skin, but the difficulty is that you do not know it is happening until it is all far too late. The symptoms of skin damage from UV rays can take up to twenty years before they appear and are noticeable. Skin cancer can affect anyone! However, there are those who are more susceptible and prone to developing it; those who have fair skin and tend to burn more easily in the sun are much more vulnerable to the harmful UV rays. Those who are more predisposed to developing cancer are those that have fair or red hair and those with freckles or moles. In a nutshell, UV rays do cause cancer and quite simply sunbathing to get a tan is seriously just not worth the risk! Today, even despite the many warnings in the media, there are still many who believe that sunbeds are a safe alternative option. Unfortunately, they are sadly mistaken, sunbeds are even more dangerous than the actual sun itself! Many sunbeds give out much higher doses of UV rays, even higher than the rays from the midday Mediterranean sun! Those who believe sunbeds are safe really need to look at the facts. To emphasize the danger it is illegal for any tanning salon to allow anyone under the age of 18 to use a sunbed, let alone to be even in the same room as a sunbed user! It is also said that those under 35 years of age who do use sunbeds now are 75% more likely to develop skin cancer later on in life. If this is not enough to put you off using them, then as well as this they can also damage your eyes and cause premature ageing of the skin. All in all, sunbeds similarly are just not worth the risk. Spray tans and tanning lotions tend to be hit and miss! With a spray tan if you have an odd wrinkle here or there you are guaranteed to end up with white lines, and if you sweat a little before the spray you will more than likely end up looking like a patchwork quilt! With false tan lotions you will be fine as long as you don’t mind a nice orange hue, but walk out into the rain and you will end up looking like a streaky mess! So the all-important question is how do you get that glowing all over natural tan, one that stays put regardless and one that has no health risks whatsoever? Tanning pills are quite simply the perfect, ideal and safe solution. Rio tanning tablets are the optimum choice when it comes to such a supplement, as they are made from all natural ingredients. If you are going on holiday, have a special event coming up or you just want a natural looking tanned glow all year round, then this supplement is the obvious answer. They allow you to acquire that all over bronzed glow, without the health risks and without the damaging ageing effects that the sun tends to have on the skin. Today there are many tan tabs on the market, so how do you choose the best? Many tan pills contain Canthaxanthin or Beta-carotene, however, this is what tends to give you that unnatural orange glow, the last thing you want! The result of taking these is the carrot effect, you end up looking like you have been tangoed! Our tanning tablets do not contain Canthaxanthin. They do not have any health risks and all of the ingredients are FDA approved. Your tan will develop naturally, so it will not streak or run off in the rain! Perfectly natural tanning pills, with perfectly natural results. You will develop a regular normal brown tan with no streaks and no lines, just an enviable and even suntanned glow. You may have many questions about our pills, such as, "So how do they work?" "What are the ingredients?" "Are tanning tablets safe?" "any customer reviews? ", and what about "before and after results?". Here we answer your most frequently asked questions about our tan tablets. WHAT ARE THE INGREDIENTS IN RIO TANNING PILLS? PABA is often referred to as Vitamin B and it can be found in many natural sources. Natural sources of PABA include liver, kidney, mushrooms and whole grains. The use of PABA is what increases the production of melanin. Melanin is the darkened pigment in the skin, that makes your skin appear tanned. This is one of the twenty essential natural amino acids in the body. As with PABA, this too is also often sold as a health supplement in shops. It is also a melanin stimulant, the reason it is in our tanning tablets. It not only stimulates melanin production, it also aids the skin in tanning by helping accelerate the process of pigmentation. Pigmentation causes the darkening of the skin. Copper is an essential trace element that is required by the body. It is found naturally in many foods including fruit, vegetables, legumes, nuts and shellfish. Copper combined with PABA produces pigmentation - darkening of the skin. This is often used in vitamin supplements, as well as in food production as an anti-caking agent. This is a calcium supplement that is often found in breakfast cereals. It is also used in toothpaste. In the manufacturing of tablets, it is used to bind all of the tablet ingredients together evenly. This is a magnesium salt used in the manufacturing of many tablets and capsules as an anti-caking agent. This is naturally found in oats, barley and rice. As with some of the other ingredients, this is often found in many health shops and stores as a health supplement. There is nothing in there that is ominous at all! All perfectly natural and safe ingredients. A tanning tablet that works and only has safe ingredients, what more could you ask for! Our tablets, as mentioned previously, do not contain Canthaxanthin. Tablets containing this tend to give that awful ‘orange’ glow, our tablets are intended to give you a more natural looking brown and golden tan. As explained every single ingredient in this product is perfectly safe. So you can take these safe in the knowledge that you are not being exposed to any nasty ingredients. Each separate ingredient is natural, safe and FDA compliant. ARE RIO TANNING TABS TAN ACCELERATORS? Do these work as accelerators? The answer to this is quite simply yes! Although they work in their own right as a tanning tablet to give you a natural golden tan, they are also extremely effective as a tan accelerator. When Rio Tanning Tablets are taken as a tan accelerator (in combination with exposure to the sun) they give you a much faster, deeper and darker tan with minimal exposure to the sun’s harmful UV rays. The tanning effects will be much longer lasting too! I HAVE A NATURALLY PALE COMPLEXION, WILL THEY STILL WORK FOR ME? Our tanning tablets are designed to work for all skin types. They help stimulate and produce melanin, which in turn will produce pigmentation which creates a tan. This process naturally colours the skin in everyone, giving skin that sun-kissed look. Rio tanning pills will give fair skin a natural golden glow, a perfect tan without any harmful exposure to the sun’s UV rays. 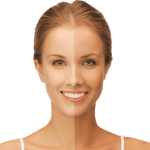 Many tanning pills reviews show that generally, it takes ten to fourteen days before you will see a difference, however as with everything we are all individual! As a general rule though you should see results within two to four weeks. HOW OFTEN DO I TAKE THEM? The tablets should be taken 1-2 times a day. DO THEY PROTECT AGAINST THE SUN? No. They do not protect against the sun’s UV rays, you will still need to apply sun lotion when out in the sun. However they do act as a tan accelerator, so you will tan quicker and deeper. With Rio tan tablets your tan will last so much longer too. ARE THESE SAFE? ARE THERE ANY SIDE EFFECTS TO THE TABLETS AND CAN ANYONE TAKE THEM? As these are perfectly natural they can be taken by most and have no side effects whatsoever. It is recommended that if you are on any other medication that you have a chat with your doctor prior to taking the tanning tablets. They are not recommended for those who are under the age of 18, women that are pregnant, or for those who have just given birth and are breastfeeding. A natural looking tan, without that orange glow! So now you know the truth about our product - before your holiday you can say adios to your local tanning salons, au revoir to painful tanning injections, good riddance to that streaky spray tan and HELLO to Rio Tanning tablets! The perfectly safe solution to obtaining that all over perfect golden tan that will last all year round. If you have tried the rest, now try the best! Rio make other similar products pale in comparison! Pale and pasty or bronzed and beautiful? The choice is yours! To supply the UK with the strongest and highest quality Tanning Tablets at the most competitive prices.